How do we manage incidental findings in research and go on to use the problem to shed light on the nature of research ethics? The initial problem concerns how to construct the research relationship in such a way as to be able to manage findings about research subjects that may of consequence or import to the subjects but which are outside the scope of the research. I propose a number of models of the researcher/subject relationship and their application to the problem of incidental findings in research. From this consideration, I develop a distinctive picture of the researcher/subject relationship which is independent of conceptions of the clinician/patient relationship and the obligations related to it. This talk will provide practical recommendations on how to deal with incidental findings. 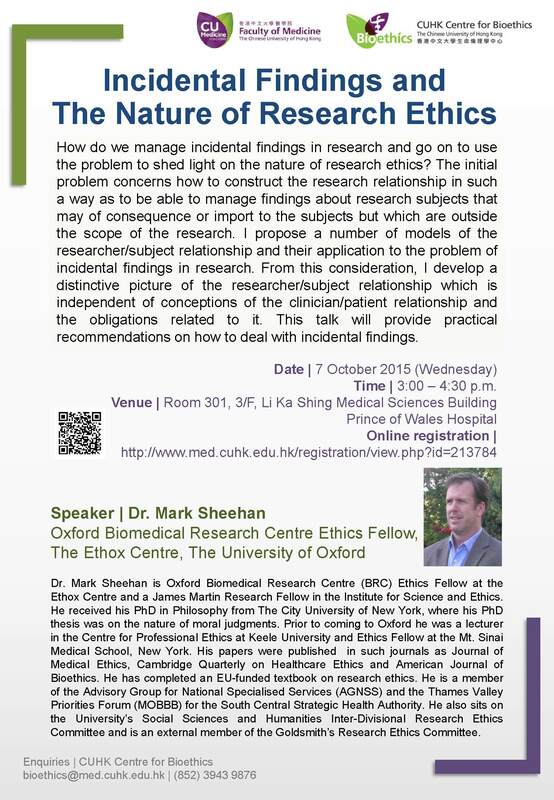 Dr. Mark Sheehan is Oxford Biomedical Research Centre (BRC) Ethics Fellow at the Ethox Centre and a James Martin Research Fellow in the Institute for Science and Ethics. He received his PhD in Philosophy from The City University of New York, where his PhD thesis was on the nature of moral judgments. Prior to coming to Oxford he was a lecturer in the Centre for Professional Ethics at Keele University and Ethics Fellow at the Mt. Sinai Medical School, New York. His papers were published in such journals as Journal of Medical Ethics, Cambridge Quarterly on Healthcare Ethics and American Journal of Bioethics. He has completed an EU-funded textbook on research ethics. He is a member of the Advisory Group for National Specialised Services (AGNSS) and the Thames Valley Priorities Forum (MOBBB) for the South Central Strategic Health Authority. He also sits on the University’s Social Sciences and Humanities Inter-Divisional Research Ethics Committee and is an external member of the Goldsmith’s Research Ethics Committee.